Marc Haendle at Ocean Independence tells me that, having sold the 30.2m sailing yacht Julie Marie in October 2012, he's now brought her back to the market renamed Rusalka. 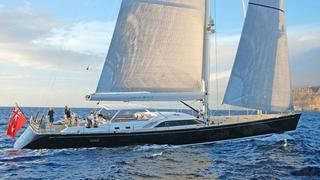 She was built by Nautor’s Swan in 2007 and is the seventh yacht in their Swan 100 S range designed by German Frers. Her interior by Nauta Design is in hand-polished satin teak and she has a Jacuzzi spa. Accommodation is for up to nine guests in four staterooms including a master suite aft with double bed, writing desk and a sofa. All guest staterooms are air-conditioned and have state-of-the-art entertainment systems and ensuite facilities. A Cummins 224kW engine gives her a range of 2,300 nautical miles at eight knots. Under her current owner, Rusalka recently completed a thorough refit, including an overhaul to her engine and mechanical systems, new sails and a full repaint. Haendle says she's now in immaculate condition and ready to go. Lying in Palma de Mallorca, Spain, Rusalka is asking €6,950,000.